“Straight out of the space age” in 1978, Playskool introduced a small toy robot with soft-touch input buttons and interchangeable cards. Running on a single 9-volt battery, Alphie the Electronic Robot stood 10 ½-inches tall x 9-inches tall and weighed a scant 1.45 lbs, making him easily portable for the intended audience of 3-8 year-olds. To conserve battery life, the toy shut off automatically when not in use. Alphie’s built-in memory was a novelty in 1978. 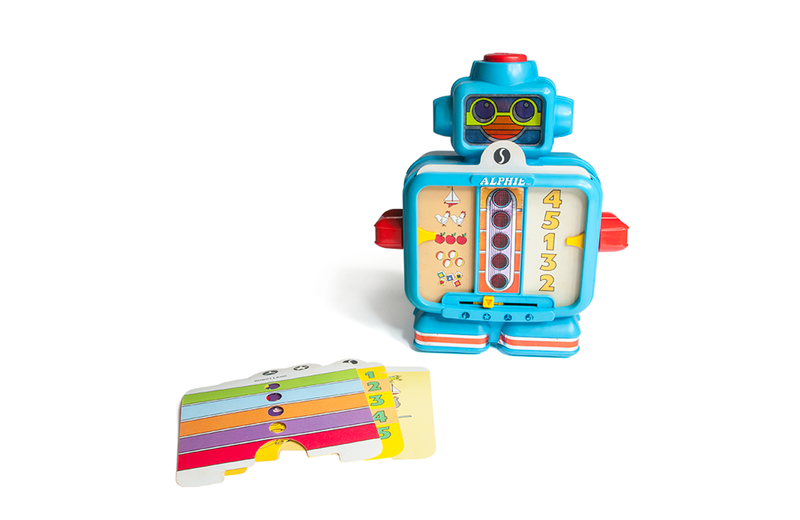 Combined with a series of two-sided activity cards, it allowed for four different activities, chosen with an “activity selector” at the front of the toy. These activities provided a mixture of fun and educational learning and include Q&A exercises, games, and music. Question and answer cards allowed preschoolers to identify numbers, colours, shapes, as well as to learn and rhyme simple words. Older children could challenge themselves with more advanced matching and counting games. Alphie’s arms were used to select questions and corresponding answers. A combination of lights and sounds gave feedback along the way – correct answers were rewarded with an electronic version of the song Stars and Stripes Forever, while an incorrect answer elicited a raspberry sound, a.k.a a Bronx Cheer. On the gaming front, Alphie came equipped with Robot Land and Lunar Landing. Each game combined a set of two-sided input cards with an external board and playing pieces. Children would move their pieces around the board by answering questions. The toy taught music appreciation by allowing kids to sing along to five favorite children’s songs. Alphie proved to be immensely popular after its initial release, resulting in seven different versions being released over the years; the latest arriving in 2010. Griddly Headz Baseball offers baseball fans a different way to experience their favourite sport and allows board-game fans a new twist on traditional board play.